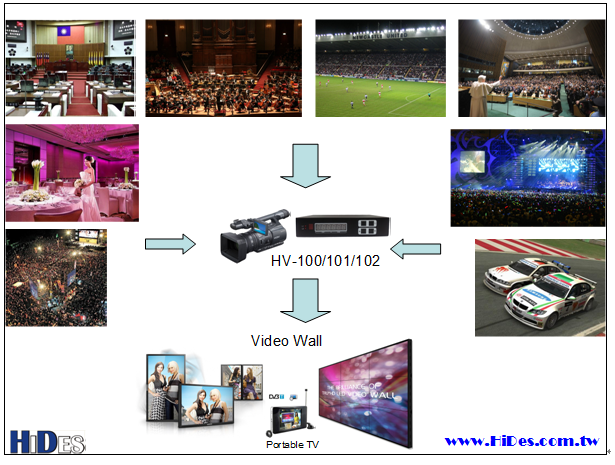 HV-200 is the most cost-effective solution to distribute HDMI or composite (CVBS) video to unlimited standard TV’s without requiring any special adapter. 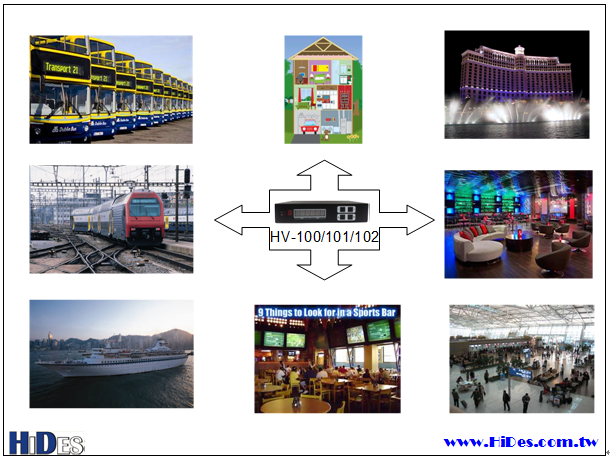 The video input source from either HDMI/DVI or composite (CVBS) is encoded in MPEG2 or H.264 streams, modulated with the open industrial standard EN 300-744 DVB-T/ARIB STD-B31 ISDB-T/ABNT NBR 15601 ISDB-Tb, and then transmitted over cable or air. 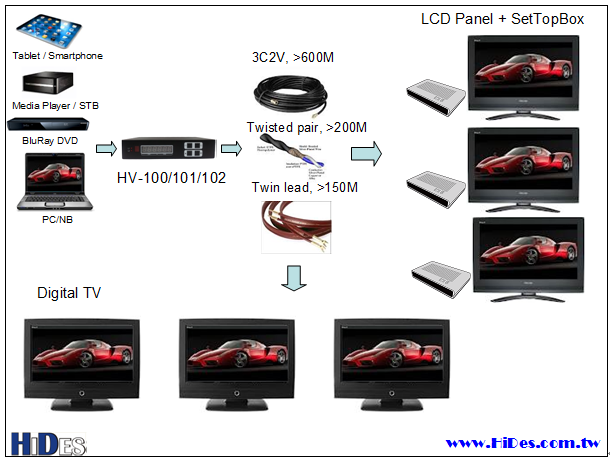 All DVB-T/ISDB-T/ ISDB-Tb compliant receivers, including SetTopBox, Digital TV, PC/NB USB DTV dongle, or DTV capture card can receive, and watch the video from a HV-200 via the standard coaxial cable or antenna. 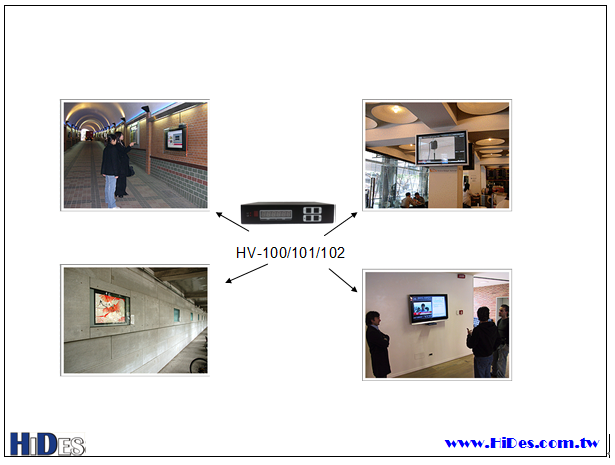 Besides H.264/MPEG2 HD, MPEG2 SD format is also supported and complaint to existing SD TV sets or STB’s. Channel number can be configured with the built-in keypad switch easily. 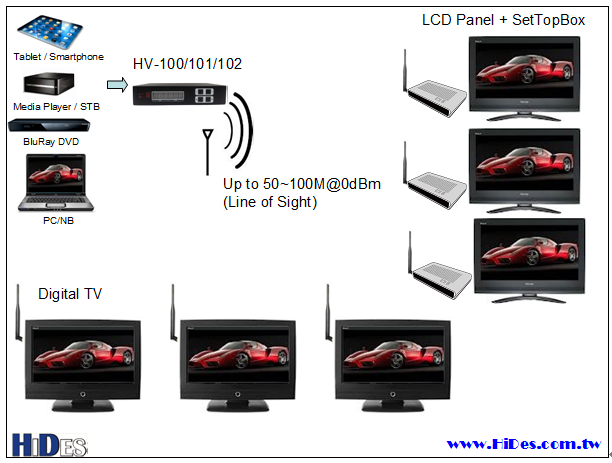 More advanced configurations can be set from an external host like PC/NB or Tablet/Pad thru USB interface. For wireless applications, the line of sight transmission distance may reach 50~100 meters at 0dBm RF radiation power and up to several kilo meters at 20 dBm. The real distance depends on the antenna design and receiver quality. 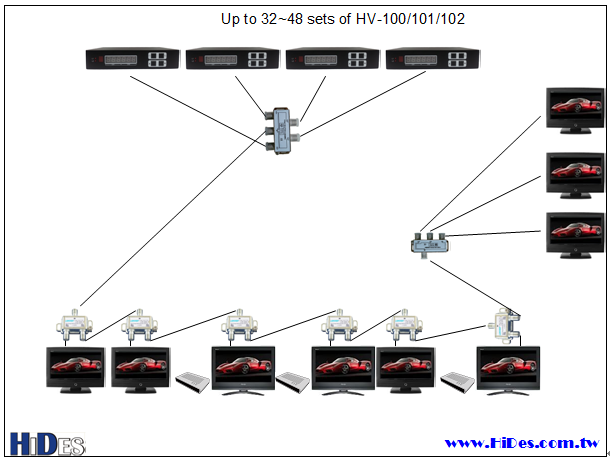 Multiple HV-200's with different channel configurations can share a single cable. It can dramatically reduce the cable deployment cost and effort. *Note: output formats supported depend on the video input formats. The frame rate should be consistent and the encoded video frame size should be less or equal to the original input. ***: There could be MER loss in high gain/attenuation level.